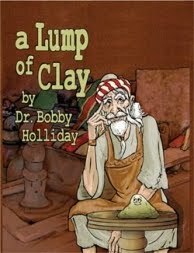 "A Lump of Clay" by Dr. Bobby Holliday is a truly enchanting tale of a little lump of clay that was created for a very special purpose. Inspired by her memory of an "imperfect, but much loved…" piece of pottery that she created at the pottery wheel during her high school years, Author Dr. Bobby Holliday, has created an unforgettable children's story that will delight and teach young children that they are valuable and created for a very special purpose. This book triumphantly encourages children, and adults alike, that even though life is full of trials and tribulations, and even when sometimes life does not go as planned, God does have a purpose, a very special purpose for them because He loves them. With beautiful illustrations done by Rebecca Price, accompanied with an audio CD done by the author who was the voice of the Lioness played by Angelina Jolie in Kung Fu Panda 1 and 2 and talented artists such as Rodger Bumpass, the voice of Squidward in SpongeBob SquarePants, this colorful, full-sized book with classic illustrations, will keep little readers fully engaged while teaching many Christian "Life-Lessons." Perfect for a bedtime story, this wonderful children's fiction book is set in Old Jerusalem, in the, "Old City of King David." Dr. Holliday weaves in historical biblical figures in this creative tale of a little lump of clay that thought he was going to be the greatest, most beautiful and prestigious creation ever to be molded by the old famous potter, "Manasseh." Little did the lump of clay know that he was created for an even more spectacular and special purpose, more magnificent than he could have ever imagined or asked to have had the humble privilege of participating in. Truly a masterpiece that you and your child will cherish together again and again! This endearing tale is destined to become a classic that will inspire, encourage and open communication with your child about Christian virtues and morals while showing your child that they are valuable and very special to God. There are so many truly wonderful gems and nuggets that can be gleaned from the tale of "A Lump of Clay." You'll want to keep this book and pass it down from generation to generation as you read it to your own children. A great gift idea for loved ones and a highly recommended read for young children. For more information about the author and her books you may contact the author through her website at Lady Hawk Press. A Lump of Clay is also available at Amazon. Other fine online bookstores and at The Author's Book Page at Book Masters.